Town Creek Family Dentistry is a small town family practice serving Lenoir City, and Knox and Louden Counties. They offer a wide variety of dental services, including preventative, cosmetic, and restorative procedures. Reflecting the warmth of the business, while presenting useful information. 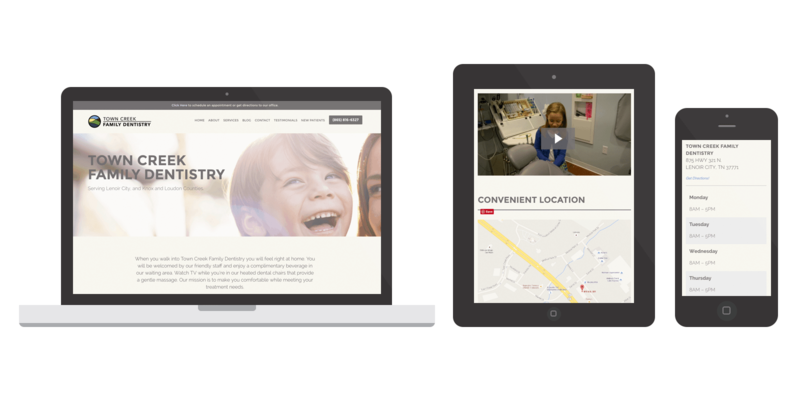 When Town Creek Dentistry approached Spark Logix Studios, they were on the verge of opening their brand new offices, and needed a new website to reflect their fantastic new location. They wanted something that demonstrated the difference between their Dental Practice, and the other dentists in their area. Spark Logix Studios was up to the challenge. With a focus on the warm, welcoming message, and the particular attention that is paid to the comfort and well being of the patients, Spark Logix Studios carefully selected the images and color scheme for the homepage, while collaborating with the client to ensure the messaging was simple, and fit with the elegant design. Spark Logix Studios also recommended adding some useful content, information that potential patients might search for in google. Using our talented on staff writer, we created the Services page, which short descriptions of each of the services offered by Town Creek Dentistry, along with a unique page for each service with a longer, more detailed description, to help with both Marketing and SEO. And of course, the site is a fully responsive website, to ensure that users have a great experience, no matter what device they use. Another great website build from Spark Logix Studios!